Having grown up in one rainy village and moved across the world to another, I’m quite fond of any object that can emerge with grace from a wet winter. The patina on a galvanised steel bucket only improves with weathering and age. The ones I’ve found around this old cottage, and picked up for a fiver at markets nearby, are thick with stories. I guiltlessly leave them out in the wet, forgotten between the compost and the greenhouse when we’ve headed out for a walk in the hills. A couple of them are understated in such an appealing manner, they’ve been invited inside. I keep one next to my treadle to catch threads and snippets, and another stands upstairs beside the tub. Their dull, perfect grey inspired the resolution of a long-considered project, which I hope to show you tomorrow. There aren’t many materials that age so beautifully. The stone chimney pot looks better and better, and the deck chairs are growing a distinguished grey, the terracotta pots are patterned with lichen, but most other objects acquire a distressing coat of slippery green in this climate, or worse, they sport mushrooms. In 1742, French chemist Paul Jacques Malouin described a method of coating iron by dipping it in molten zinc in a presentation to the French Royal Academy. In 1836, French chemist Stanislas Sorel obtained a patent for a method of coating iron with zinc, after first cleaning it with 9% sulfuric acid (H2SO4) and fluxing it with ammonium chloride (NH4Cl). Zinc-coated. Endlessly useful object, the galvanised bucket, the sort one might comfortably have around for generations without really noticing. Penny whistles are fine little folk instruments, a variation on the old world wooden whistle. The tin whistle was first made in Victorian times and has a splendid story to go with it. My penny whistle was constructed very much as these whistles always were, not far from our little cottage, and it arrived complete with a sheet of Victorian singing games. It’s a pretty little pipe, I’m quite fond of it, especially for joining in on a jig with my tall violinist. The penny whistle is also one of the traditional instruments I like for playing the little appleturnover song I made up a long time ago. For requesting apple turnovers, naturally. If you like you can listen to it. The children helped me with the very important bit of singing. After a winter of hard work on the wood stove, the copper kettle needs a good polish. How to polish copper? You’ve got copper to polish, and needed to know. I thought so. Like polishing silver with toothpaste, there’s an ecological, economical solution. Dip a cut lemon into wood ash (wear some gloves in case it is too intense for your skin!) and scrub. This is messy, best to do it outside. Rub, rub, rub with a soft cloth. Rinse thoroughly with water. Anything left in the grooves might create verdigris, which is toxic, so clean it up well, an old toothbrush works. Repeat til shiny, then polish with a clean cloth. It looks so pleasing! It gives me energy for the next task. With thanks to that wonderful book, Sloe Gin & Beeswax. Today’s River Cottage tried & true is from Head Gardener Mark Diacono, who led us in a delicious study of vegetables at the cookery course. He’s the author of the Veg Patch handbook, which I plan to spend the winter poring over in anticipation of spring. Mark nominated his copper trowel. Exquisite object! Mark says it cuts the earth effortlessly, doesn’t rust, and has such a striking colour that it isn’t easily lost in the garden. (Especially as it is such a delight to use, and not inexpensive, you do take care not to lose the thing.) He guesses it will easily outlast him. 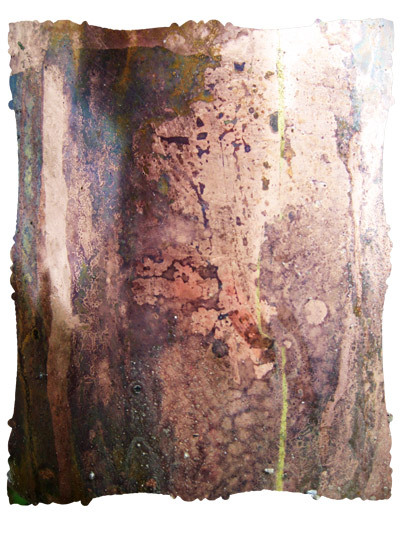 I read a little about copper tools in the garden, there are some fascinating ideas about copper’s qualities. Of course I openly admit to having a weakness for shiny things. Thank you Mark, I’m wracked with envy. 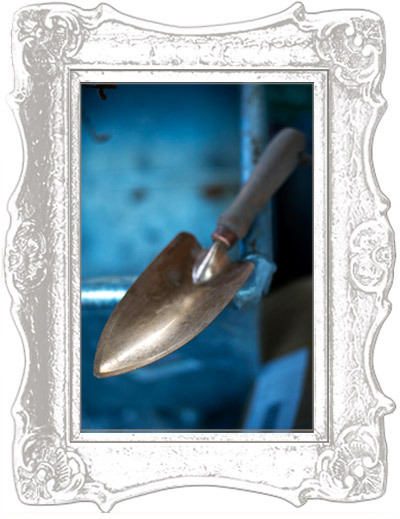 You might like to follow Mark and his copper trowel over to Otter Farm for a visit. 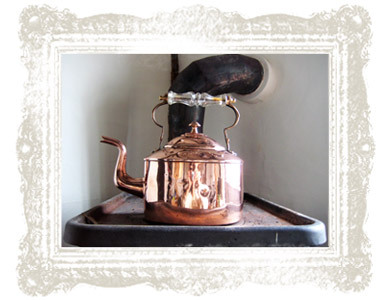 p>Today I thought you might like to meet our copper kettle. It’s a vintage thing, and I’m rather fond of its glass handle. It holds a lot of water, into which I’ve dropped a charcoal filter and I’ve spent the day filling my tea cup from it, or adding hot water to things I’m cooking. The taste is exceptionally clear, I like it very much. 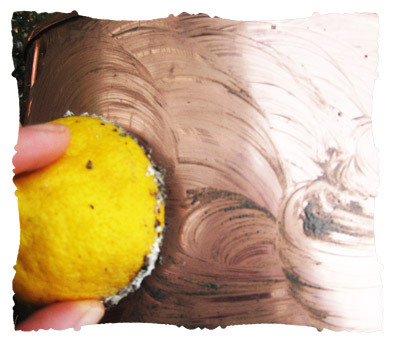 Copper is a great conductor and from what I could find out, a good element to have a decent trace of in your diet. And you know how I like shiny things. 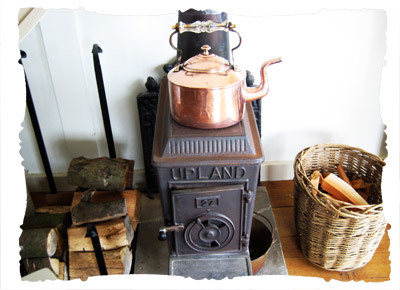 I expect it to work hard and save us its worth in electricity, while it reigns elegantly on the wood stove.